Sometimes I hear about a big largemouth bass socked on a livelined sunfish. I wondered, is that legal? That’s because gamefish are illegal to use for bait. I telephoned law enforcement at Fish and Wildlife and asked. But sunfish – a variety of species are called sunfish, including pumpkinseeds, bluegills and others – are natural forage for largemouths. I guess that’s why LiveTarget’s sunfish lures are attractive to anglers. 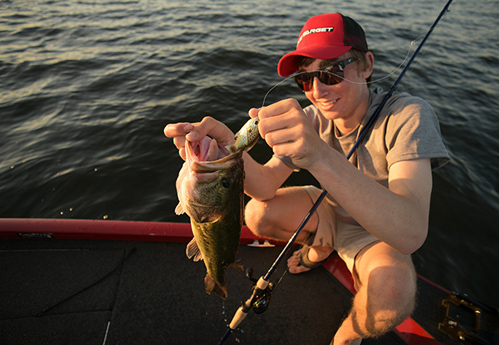 Well, the stories about big bass caught on livelined sunnies is the reason, actually. Largemouth bass themselves are actually a species of sunfish, but when people talk about sunfish, they usually mean pumpkinseeds. The company makes a number of sunfish lures, all of them pumpkinseeds and bluegills, for different actions and to cover the water column from top to bottom. LiveTarget is known for realistic-looking lures, and these are that. They’re a Swimbait, a Hollow Body, a Wakebait, a Rattlebait, a Crankbait Shallow Dive, a Crankbait Medium Dive and a Squarebill. Each is available in different colors of pumpkinseeds and bluegills. The Swimbait is the newest.